Map showing the locations of Baschurch and Wroxeter (Viroconium) and near Shrewsbury. Graham’s ultimate aim was to discover where Arthur was buried. Owain Ddantgwyn had been a king of Powys, and, astonishingly, the burial site of the kings of Powys was also revealed in the Song of Llywarch the Old, the work that relates how the Powys king Cynddylan had been a direct descendant of King Arthur. According to the author, Cynddylan was buried at a place called the “Churches of Bassa”, and that his predecessors, the former kings of Powys, were buried here too. As this included Owain Ddantgwyn, it would seem that the Churches of Bassa could well be the final resting place of King Arthur himself. The Churches of Bassa is today called Baschurch, a village and surrounding district some eight miles north-west of Shrewsbury. 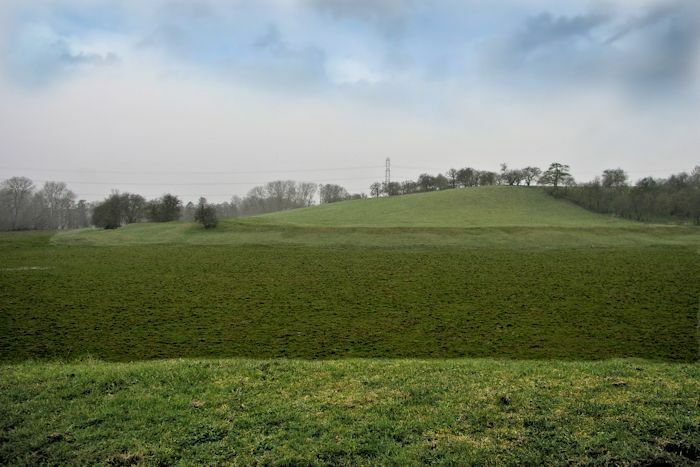 Graham believes that the burial site referred to in the poem was a complex of ancient earthworks in fields just outside the village. Standing on a plain of marshy land, it is comprised of a small hill covering some four and a half acres, surrounded by two artificial circular embankments, together with an oval area of raised ground around an acre in size, 120 metres to the northeast, also surrounded by a manmade earthen rampart. The two earthworks are connected by a linear causeway, and a further 240-metre causeway linked the hill to rising ground to the south. Today, much of the low-lying area around the complex has been drained for farming, but in earlier times, when water levels were considerably higher, the two enclosures were islands surrounded entirely by a single lake. Today the hillock is called Berth Hill, and the oval acre is known locally as The Enclosure; both features, together with the causeways, are collectively called The Berth. So, during the Dark Ages, The Berth consisted of a pair of connected islands in the middle of a lake about half a mile long and wide. Only parts of this original lake still survive as a number of smaller lakes, the rest is pasture land used for the grazing of livestock. Only limited archaeological excavations have been conducted at The Berth, and all that is known for certain is that it had been occupied in pre-Roman times, and had later been used as a ceremonial site between the mid-fifth and mid-seventh centuries. 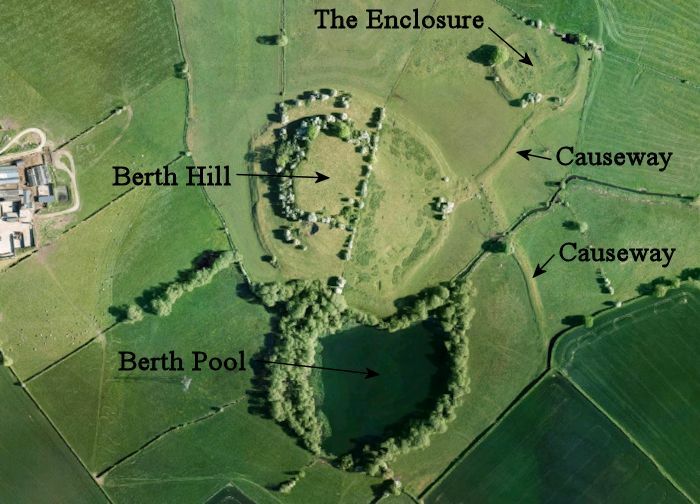 The Berth at Baschurch, showing Berth Hill and The Enclosure ringed by ancient earthworks. During the Dark Ages these were two lake islands conected by earthern causeways linking them together and to the higher ground to the south. When Graham first visited The Berth, no one knew if it really was the burial site of the kings of Powys as the poem asserts. Because the Song of Llywarch the Old only survives in later copies, some historians even doubted its authenticity. There was only one way to determine if the poem was genuine: to find out if the grave of Cynddylan was where the work says it was.